The commissioner's decision has angered farmworker advocates and re-energized their push for stronger pesticide enforcement laws. An effort to increase fines failed in the Legislature earlier this year. "I think it's atrocious," said Mark Weller, co-director of the Berkeley-based Californians for Pesticide Reform. "The regulations obviously fall far short." The company involved in the incident, Tanimura and Antle, disputes claims that pesticides caused the workers' symptoms. The Monterey County agency's findings, which KQED obtained through a California Public Records Act request, disclose a range of symptoms reported by fieldworkers who were transplanting celery starts near Salinas when they were overcome early the morning of June 22, 2017. "I began crying because I couldn't breathe and my vision was blurred," one unidentified worker said. "I had a severe headache, nausea, sore throat and numb feet," another employee said. The company took some workers to Salinas Valley Memorial Hospital in Salinas, but didn't have enough vehicles to transport all of the sickened employees. Several fieldworkers had to get themselves to the hospital. The failure to get prompt medical attention for all of the affected workers is the subject of the one violation the agricultural commissioner's office plans to issue against Tanimura and Antle. "A hazard was created when those who were experiencing illness symptoms, including dizziness and nausea, were allowed to drive themselves, and others, to (Silicon Valley Memorial Hospital), creating an unsafe condition," wrote Ronnie Capili, a Monterey County agricultural inspector. The maximum fine the commissioner's office can levy against the company for that violation is $5,000. "I was absolutely shocked," Weller, with Californians for Pesticide Reform, said in an interview after reading the commissioner's findings. Despite the extreme nature of the farmworkers' symptoms and the large number of employees who became sick, the commissioner's office said it did not find any other violations tied to the case. "There were no issues during the applications, therefore no non-compliances were noted," wrote Capili. Anne Katten, director of the California Rural Legal Assistance Foundation's Pesticide and Worker Safety Project, said that finding shows that pesticides sprayed in foggy conditions can present a heightened danger. "Fieldwork should not be allowed so close to fields just treated with pesticides," Katten, who also reviewed the findings, said in an email. "This is a problem that needs to be remedied before more workers are placed in harm's way." "How can one part of the company know that they've applied extremely hazardous pesticide at 10 o'clock one night and then not inform the next morning's crew?" Weller asked. "That's asking for this kind of awful accident." After they were taken to the hospital, the agricultural commissioner's office sent clothing from the farmworkers to a California Department of Food and Agricultural lab to test for pesticides. Permethrin is the active ingredient in Pounce, an insecticide sprayed on close to 19 acres of celery on the farm's Block 6, a field next to where the farmworkers parked their vehicles. The chemical is classified by the Environmental Protection Agency as a weak or likely carcinogen. The EPA says methomyl is extremely toxic if ingested or "moderately toxic" if inhaled. In high enough doses the chemical can "overstimulate the nervous system", leading to nausea, dizziness and confusion, according to the agency. Federal officials say at very high exposures, methomyl can result in respiratory paralysis and death. But in an incident report obtained by Monterey County officials, the firm defended its employees' actions and noted that all but one of the sickened workers returned to work "without issue" the next day. "We cannot find a direct link to any chemical exposure which was the contributing factor to the symptoms felt by our employees," Javier Medina, a human resources employee with the company, said in the report. "As a result of this incident, the decision has been made to avoid working near any posted fields whenever possible," Medina added. 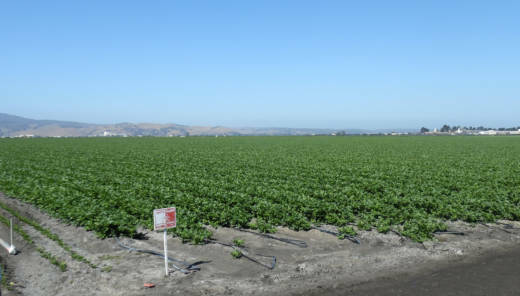 The Monterey County agricultural commissioner's report is the last of four investigations into pesticide drift incidents that sickened a total of 150 agricultural workers in Central California last year. Those included two episodes in Kern County and another in Santa Cruz County. In June, the Santa Cruz County Agricultural Commissioner's Office issued $56,000 in fines against several companies it found responsible for a chemical drift that sickened 15 raspberry workers in Watsonville last year.